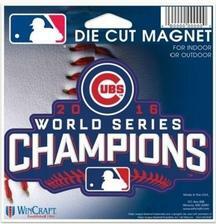 MLB World Series 2016 Chicago Cubs 4.5" x 6" Die Cut Magnet - $7.95 - GolfersEdgeOnline.com - Best Golf Equipment On The Web! Die cut 4" magnet made of weather resistant materials. The magnet is great for the back bumper, refrigerator, or tool box. Made in the USA. MLB World Series 2016 Chicago Cubs Classic Carded Pennant 12" X 30"
If you have any more questions about the MLB World Series 2016 Chicago Cubs 4.5" x 6" Die Cut Magnet; do not see the model you are looking for; need custom options; or prefer to not purchase online, then please call us at (630) 656-1291.